Lonavala is an important tourism destination of Maharashtra state. This place is also called as Jewel of Sahyadris. It is situated at a height of 620 meters above sea level. This place is endowed with some of the finest natural gifts such as hills, waterfalls, lush greenery and cool winds, thus making the entire ambiance extremely soothing and enjoyable. It is one of the favorite hill stations of people of Mumbai and other nearby areas. Come weekends and you can see most of the stressed out Mumbaiites coming here to take a break and rejuvenate themselves. What makes this hill station so special is the fact that it has a very hospitable weather almost throughout the year and is definitely a welcome change from the concrete jungle. The weather is very pleasant. This is also a popular health resort due to the pleasant climate. It's popular getaway from Mumbai and Pune., which located at 110 Kms. from Mumbai and 65 Kms. from Pune. The population is around 50,000. Summer here (April-June) are mild, while winter is cool (November-Februry). It experiences heavy southwest monsoon rains between June and September. The mountainous terrain is ideal for trekking and hiking. The temperatures range from 11 degree celcius in January to around 30 degrees in May while the rain fall is highest in June and July months. Summer season here generally lasts from April to Mid June every year. The summer is generally mild. The temperature rises to around 34 deg. celcius during day time in summer. So the day time in summers is warmer and the temperature drops down to a minimum of 16 to 18 deg. celcius during nights. Occasional showers and the evening breeze help to cool down the temperature and make it very pleasant. You can carry light cotton clothes if you are visiting in summer season. Due to the continuous mountain breezes, the heat of summer is not at all felt at this famous hill resort. This is the reason lot of tourists come for site seeing even in summer season. This place is generally full of tourists from the nearby cities of Pune and Mumbai during the summer season due to its cool and favourable weather. The summers are pleasant and temperature varies between 18 deg. celcius to 34 deg. celcius during the summer season. It is really pleasant and is ideal for site seeing during the summer season. The winter season generally lasts from November to Mid of March and the weather is much cooler in winter season. The weather remains cool but not cold in Winter season. The days during the winter season are warm and pleasant and sun is also soft in winter season. The temperature during the nights may fall to 11 deg. celcius in winter season. We can see a lot of tourists coming for site seeing during the festive months of December and January and is an ideal tourism spot during the Christmas and New Year eves. it is very nice for wandering around the city . Light woollen clothes are sufficient if you are traveling this place after October. The average temperature during this time remains around 12 to 14 deg C.
The monsoon season lasts between Mid June to September. 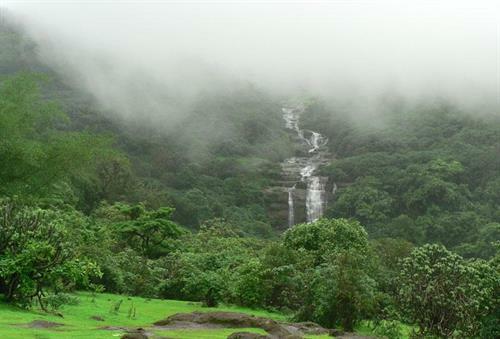 The monsoons turn this great hill-station of Lonavala into a magical paradise! In fact, all those who have a penchant for traveling, come here during monsoons and swear by the magic and beauty. The black clouds and smell of rain in the air is enough to heighten your senses and give you a thrill of getting drenched in the rain like never before. This is the best season to visit this place. We can see a lot of tourists there at this time. Although pleasant throughout the year, monsoon has its own unique charm. It's the perfect place to enjoy the rains. It offers breathtaking views of valleys that are full of evergreen forests and flowing springs and waterfalls. Lonavala is an important hill resort and the most visited tourism attraction near Pune an Mumbai cities. It is located at a height of 625 meters above the sea level. This is the favourite monsoon picnic spot of Pune and Mumbai people. This city is popularly known as the 'Jewel of Sahyadri mountains'. Some of the places worth visiting around Lonavala are Bhushi Dam, Rajmachi Point,Duke's Nose, Kune Falls, Khandala Dari, Rye-Wood Park, Tiger's Leap, Tungarli Lake, Valvan dam, Yoga Institute, Ghanbirnath caves, Bhusir lake, and INS Shivaji (a Navy Training Center). I'm planning a visit to Lonavala in April. Is it too hot there? The other option is to wait till November but I think it will be very expensive during that season. Can you suggest me the best time to visit this place?